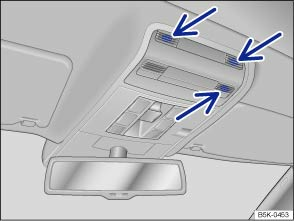 The interior monitoring system will trigger an alarm if movement is detected inside the vehicle when the vehicle is locked. The anti-tow alarm will be triggered if the vehicle is lifted. Lock the vehicle using the vehicle key. When the anti-theft alarm is switched on, the interior monitoring system and the anti-tow alarm are also active. 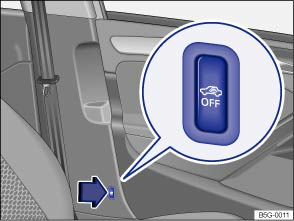 When interior monitoring and the anti-tow alarm have been deactivated by pressing the button , these functions can be reactivated by pressing the button again. The yellow indicator lamp goes out. The orientation lighting in the button must be lit up when switching the systems off. To switch the orientation lighting on, remove the vehicle key from the ignition lock and open the driver door. Press the button . A yellow indicator lamp will light up in the button until the vehicle is locked. Lock the vehicle using the vehicle key. The interior monitoring system and anti-towing alarm are switched off until the next time the vehicle is locked. If any people or animals are to remain inside the vehicle for a short period. If the vehicle is being transported (e.g. on a ferry). If the vehicle is to be parked in a two-storey garage. If the vehicle is to be parked in a car wash. If one or more windows are fully or partly open. If the electric panorama sliding/tilting roof is fully or partly open. If a mobile telephone that is left in the vehicle vibrates. If the vehicle is being parked in a two-storey garage. If the vehicle is in a car wash.